PVWatts relates these two variables to the maximum power point ( ) with two equations depending on the irradiance level. where and are reference irradiance (1000 W/ ) and reference temperature (25° C), respectively. is the temperature correction for maximum power ( ). This modified output at low irradiance was observed by researchers at Sandia National Laboratories and introduced in a early model called PVFORM. PVWatts is designed for x-Si modules and is not recommended for thin film technologies. 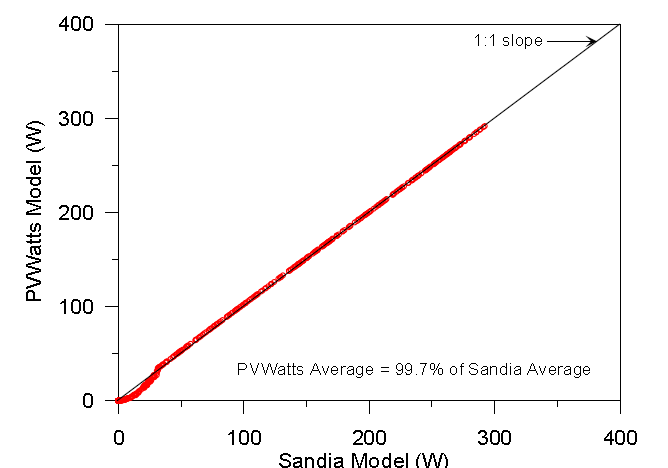 Below is an example from Marion (2010) comparing performance predictions from PVWatts and the Sandia PV Array Performance Model (SAPM). Marion has proposed improvements to the PVWatts model which are described here.